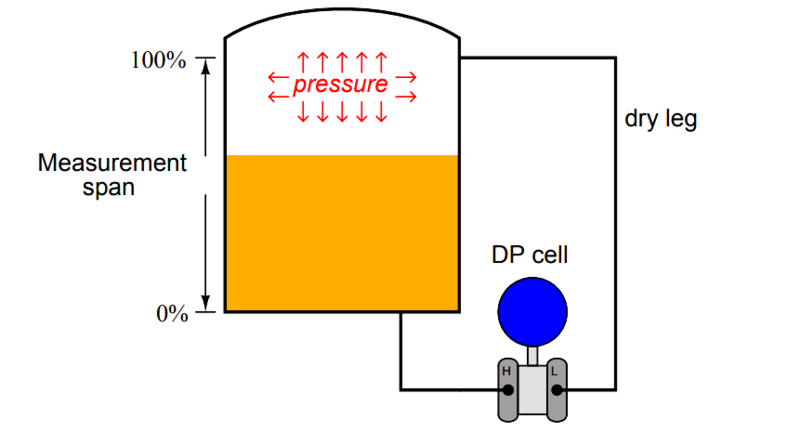 If the specific gravity of the liquid inside the vessel increases, what aspects of the transmitter’s calibration will we need to change in order to maintain accurate liquid level measurement? A displacer-type level transmitter has a cylindrical displacer 30 inches long and 2.5 inches in diameter. 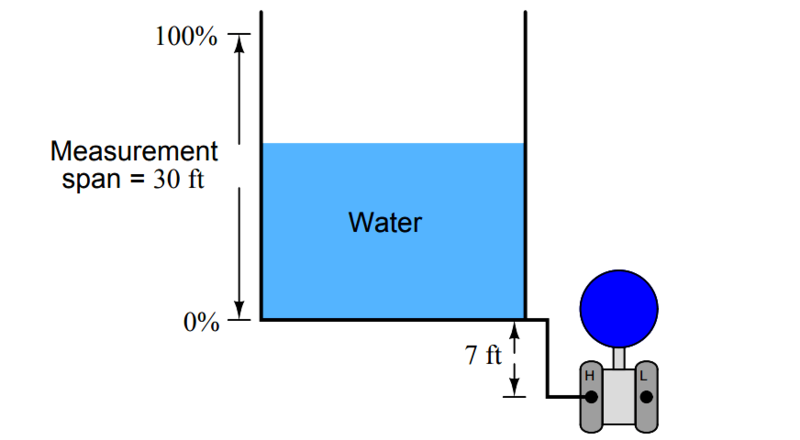 When fully submerged in a petroleum fuel (Gf = 0.82), how much buoyant force will the displacer generate? Which of the following level-measurement technologies cannot be adapted to measure solid (powder) level in a vessel? 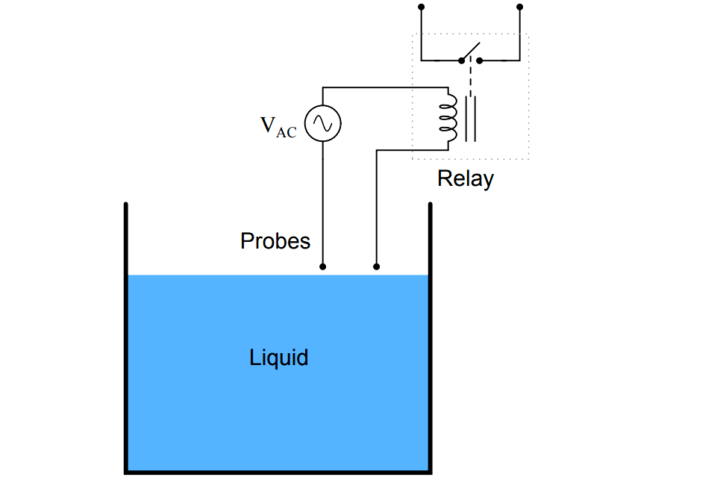 A guided-wave radar transmitter is able to measure liquid interface levels based on differences of between the two liquids. The following liquid level switch will only function with liquids that are . Calculate the hydrostatic pressure at the bottom of a vessel holding 17 vertical feet of liquid with a density of 55 lb/ft3. first of all such tank with such type of liquid can be called a Blending type i.e. for example we have Gasoline tank of different Density from reformer unit ,if we want to achieve accurate level measurement using for example Level measurement type (D) and regardless the other types also can be use and whether the others can give accurate level measurement or not and even for my selection (D) ,all types can not first measure the density together with level ,only level with accuracy related to any side effect during filling the tank or evacuate using pumps . yes, here the level measurement can be changed from type to type,but to measure or sense the density if we have different sections(Unpredictable density ) on the assumption that we have Blending Tank as i mention above or other tanks for Kerosene also receive slop of density approach to Kerosene density and so on for Gas-Oil as well. So we can measure the density of the blend product by using what so called Density on line meter and can be install together with the level or away from level transmitter but on same line of O/P port of tank and can read the density for each section and we can sense where is the density change for example Gasoline of density (0.71-0.77 kg/L or 719 KG/M3 ) this means different ranges of density or maybe we have slop (mixed product ) its density approach to Gasoline density (by the way slop comes from loading arms for tankers and usually pumped from slop tanks to main tanks products if the chemist after doing chemical test on its density decide to which tank should be pump .the density meter shall have a read unit inside the control room or even outside of Exd type the operator can watch the change in density . So the most successful measurement for a tank have Unpredictable Density to measure its level or accurate level is to use the above even the last one but for Density we need to install what so called ON Line density meter( 4-20 mA ) Output like On line viscosity meter to viscous liquids ,what is for level should be use and what is for density also should be use there is no common equipment use 2 in 1 i.e. even if we have different section or density no level measurement can sense accurately and read the level during the change of density for each section again despite the relationship between Height /Pressure /Density on mathematical model . Thank you Mr. George Ibraheem Yokhana, for sharing your knowledge & experience with us. Please provide justification against answers which will help to understand & clear the concept.